Monopodial orchids are one of the two main growth habits of orchids (sympodial orchids are the other kind.) These plants have a single main stem, which produces a series of leaves at the apical bud at its growth tip. Roots and flower stems emerge at the nodes above each leaf. The stem may occasionally branch, but this is infrequent in most types of orchids. A monopodial Vanilla orchid. Did you notice the flower stem above one of the leaves? Plants that grow this way lack pseudobulbs so they have little ability to store moisture. (Thickened, waxy leaves can help.) So they need typically need to be watered frequently, usually without drying out too thoroughly in between waterings. 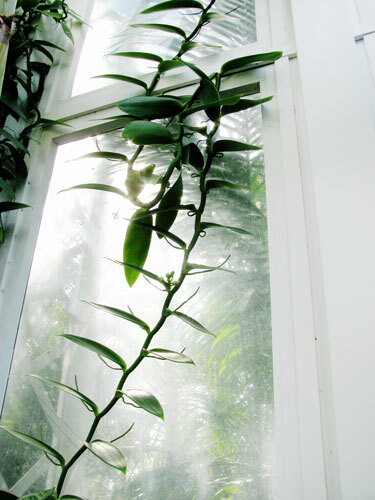 In many cases, the aerial roots produced between the leaves are one of the plant's main sources of moisture; if this is the case, provide plenty of humidity and mist the plant or otherwise moisten its roots regularly. Unlike sympodial orchids, division is difficult, and is best avoided except by experts. Keikis are usually your best bet to propagate these orchids. The most common types of orchids you'll see with this growth habit are Phalaenopsis, Vanda, and their relatives in the Aeridinae subtribe (formerly known as Sarcanthinae). The other common types also fall within tribe Vandeae, and include plants in the subtribe Angraecinae (which includes Angraecum and its relatives) and the subtribe Aerangidinae (which includes Aerangis and its relatives). One advantage of these plants in cultivation is that their upward growth habit often prevents them from outgrowing their pots after reaching blooming size. So when you repot you can usually reuse the old pot with a new potting mix.